I collided with a stationary truck coming the other way. A pedestrian hit ME, and went under my car. The guy was all over the road. I had to swerve a number of times before I hit him. I pulled away from the side of the road, glanced at my mother-in-law and headed over the embankment. To avoid hitting the bumper of the car in front, I struck the pedestrian. When I saw that I could not avoid the collision, I stepped on the gas and crashed into the other car. The pedestrian had no idea which direction to go, so I ran over him. The telephone pole was approaching fast. I was attempting to swerve out of its path when it struck my front end. I saw the slow-moving, sad-faced, old gentleman as he bounced off the hood of my car. We laugh at others peoples misfortune, but how do we respond when it happens to us? Can you smile when there is nothing to smile about? How do you react when life is UNFAIR? When you are…pressured, busy, chaotic, sorrowful, sad, confused, frenzied, messed up, upset, complicated, bummed, disappointed, burned, … how do you RESPOND; how do you ACT; how different are YOU? When your friends at school turn on you? When your boyfriend or girl friend walk away? When your spouse is mad at you and you don’t know what to do? When your kids just won’t obey, no matter how consistent you are? When the money has run out, when your body groans out, when you are so exhausted you can’t think? What’s your demeanor? 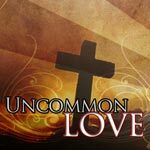 The bible tells us repeatedly – that we Christians must REACT DIFFERENTLY to life’s trials. 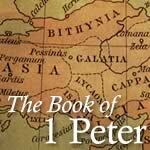 And today, Peter will explain just how different we should be – open 1 Peter 1:6 + outline. 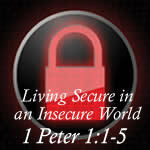 Peter’s readers are experiencing unfair trials, life difficulties, even some persecution for their faith. Think about it – They’ve been ripped from their homes and sent to a foreign land and now have to start over with people who are suspicious of them since Rome kicked them out and sent them far away to the black sea! So Peter does not waste any time in verses 1-5 reminding them they are CHOSEN by God, being transformed by the Spirit, obedient to Christ, cleansed by His blood, born again, with a secure hope in a future with God in heaven AND all of that will cause a TRUE CHRISTIAN to act DIFFERENTLY when experiencing TRIALS…HOW? Christians can smile when there is nothing to smile about. Genuine believers should be BRIGHT on the DARKEST DAYS. True Christians will REJOICE during trials – what’s Peter say? Start reading with me at verse 6 – and let me have you underline two statements that form bookends to this passage. 6 In this you greatly rejoice, even though now for a little while, if necessary, you have been distressed by various trials,7 that the proof of your faith, being more precious than gold which is perishable, even though tested by fire, may be found to result in praise and glory and honor at the revelation of Jesus Christ; 8 and though you have not seen Him, you love Him, and though you do not see Him now, but believe in Him, you greatly rejoice with joy inexpressible and full of glory,9 obtaining as the outcome of your faith the salvation of your souls. Vs6 In this you greatly rejoice, even though now for a little while, if necessary. TUNE IN as I get a little technical for a MOMENT! In English, we have one basic kind of IF, but in Greek you have several different kinds of IF and this one is a first class conditional IF, meaning the writer assumes it’s true. In other words, it’s TRULY necessary, you experience trials. Necessary is a type of word which gives it on-going action. In English the true sense of necessary is NECESSARY-ING. In fact, written in the Greek, but not appearing in the English is the verb IT IS, actually making this little phrase very POINTED even though now for a little while, IT IS TRULY NECESSARY you have been distressed by various trials, NOW THIS IS so ENCOURAGING – ‘really Chris, you’re loopy’, NO! IF NECESSARY tells us that trials are required, but also tells us ONLY when necessary – not everyone endures the same trials and not everyone endures the same level of suffering, but only what is necessary for each person, each family and each church. One of my favorite Narnia books is The Horse and His boy and in it, there are several lion attacks. At the end of the adventure, the Christ figure, Aslan the great Lion, confesses that all the Lions who attacked them in their adventure were him. At which point, one of the characters asks why one particular character was not attacked and clawed. Aslan tells him, that is HIS story, not YOURS. I only tell you YOUR STORY, not another’s. Everyone has their own story. I don’t know WHY certain people suffer more than others nor do I know WHY certain people suffer less or more than me – but I do know THIS – that everyone has their own story and that Christ is the one who writes each of our LIFE stories. ALSO IF NECESSARY tells us God is in control of our Trials – they only hit us when they are necessary, they only COME when God allows trials or God causes trials. And when God allows His children to go through the furnace, He keeps His eye on the clock and His hand on the thermostat. Even with temptation, God is very very clear, when He says in 1 Corinthians 10:13 No temptation has overtaken you but such as is common to man; and God is faithful, who will not allow you to be tempted beyond what you are able, but with the temptation will provide the way of escape also, that you may be able to endure it. Nothing happens to you outside of God’s control – even trials, even suffering, even temptation, suffering, injustice and death. What did Peter say about the DEATH OF CHRIST on the cross? Acts 2:23 this Man, delivered up by the predetermined plan and foreknowledge of God, you nailed to a cross by the hands of godless men and put Him to death. God predetermined the horrific cross of Christ yet men nailed Him to the Cross and put Him to death – God is in control, friends, and trials are a part of His plan. That is why we can rejoice when there is nothing to smile about even when it HURTS. Verse 6 In this you greatly rejoice, even though now for a little while, if necessary, you have been distressed by various trials. Trials are painful; the word distressed actually means to make sad, sorrowful, grieved, or pained. How do you like that? We are to be exceedingly GLAD, leaping, dancing and rejoicing even when we are sad, grieved and pained…How does that WORK? This is so good, it hurts! God doesn’t expect you to pretend OR to put on a fake face when your guts have been punched by life. There is no place for silly type gladness at the death of a child or when a beloved brother or sister is in great physical pain – With this word DISTRESSED or GRIEVED, our Father is acknowledging sorrow, hurt, physical suffering and mental anguish – but underneath, internally, God also has given us JOY and a great awareness of the temporary nature of our trial and suffering – Peter’s readers may be in a bad place with their families now surrounded by hostile people and with no source of income; they’ve been distressed by this, saddened in heart and physically pained. But they can greatly rejoice because they are verse 1 and 2 chosen by God, the Spirit will use this distress to make them like Christ, who they can obey and when they fail – are covered by His blood. Verse 3-5 say they’ve been made alive, with the certain hope of a future resurrection in Heaven forever guaranteed by the resurrection of Jesus Christ – all protected by the power of God. So HOW do you get through the pain with JOY? Keep your eyes on Jesus. Hebrews 12:2 fixing our eyes on Jesus, the author and perfecter of faith, who for the joy set before Him endured the cross, despising the shame, and has sat down at the right hand of the throne of God. Your joy through the pain of distressing trials comes as you keep your eyes fixed on the one who went through the greatest pain and the greatest distress, keeping the end result OF JOY before Him. HOLD YOUR PLACE and TURN TO 2 Corinthians 6:4ff Look at what Paul went through and see if you can discover both JOY and SORROW both together in His experiences, too. 2 Corinthians 6:4 … as servants of God, in much endurance, in afflictions, in hardships, in distresses, 5 in beatings, in imprisonments, in tumults, in labors, in sleeplessness, in hunger, 6 in purity, in knowledge, in patience, in kindness, in the Holy Spirit, in genuine love, 7 in the word of truth, in the power of God; by the weapons of righteousness for the right hand and the left, 8 by glory and dishonor, by evil report and good report; regarded as deceivers and yet true; 9 as unknown yet well-known, as dying yet behold, we live; as punished yet not put to death, 10 as sorrowful yet always rejoicing, as poor yet making many rich, as having nothing yet possessing all things. Paul was sorrowful,same word as distressing here in 1 Peter, yet ALWAYS rejoicing – because trials are temporary and necessary. BUT there is even BETTER news about trials – in fact, it is so good, it will actually almost make you WANT to have more trials. What are they? 4th in your outline and the remainder of this outline, will be completed NEXT WEEK and you’ll just have to come back. Peter’s words are even MORE encouraging and life changing and shocking – hurry back…But as we close, God’s Word has made some strong challenges. 1. Christians are a GLAD people, so let God’s Joy show. There is no need to put on a show but there is no reason to not show your JOY, gladness, celebration, thanks and praise. Even on our darkest days, we should be shining BRIGHT! Even when our hearts are breaking, there is a solid hope, and an internal joy that burns within every genuine Christian. Unplug the cork, and let your JOY out, celebrate a little more of what it means to be a child of God. Give a few more Amens, clap a little loader, move your body a little when you sing – when someone shares a victory, celebrate the Lords work – Joy in God’s work in others honors Him… I used to love it when I could make my boys super GLAD – God feels the same way…I am not suggesting you turn charismatic, but you can’t ignore God’s Word and God’s expectation of Joy and Rejoicing. Romans 15:13 Now may the God of hope fill you with all joy and peace in believing, that you may abound in hope by the power of the Holy Spirit. Habakkuk 3:18 Yet I will exult in the Lord, I will rejoice in the God of my salvation. Philippians 4:4 Rejoice in the Lord always; again I will say, rejoice! Christians are GLAD people – show your joy – are you a Christian? 2. Not having or showing Joy is a serious SPIRITUAL issue. Friends, the fruit of the Spirit is JOY; IF there is no joy in and through you – even manly men, quiet women, shy kids, and science geeks that means you are only and always IN THE FLESH which points to the fact that you don’t KNOW Christ. You need to turn to Christ today in repentance and faith CRY OUT to GOD to give you a new heart of JOY! 3. What brings us the greatest joy is Christ and His SALVATION. Listen to this powerful verse from Isaiah 61:10 I will rejoice greatly in the Lord, My soul will exult in my God; For He has clothed me with garments of salvation, He has wrapped me with a robe of righteousness, as a bridegroom decks himself with a garland, and as a bride adorns herself with her jewels. NO matter what you have gone through, are going through or will go through – how can you not rejoice in the LORD and exult in your God? Because of the sacrifice of Christ on the cross, God has clothed you with garments of salvation, he has taken your sin upon Himself and wrapped you in a robe of His perfect righteousness so that you can stand before a Holy God now and forever in heaven you are ready to be ONE [like a bride] with God forever. Let’s leave here today full of the JOY of our salvation.